Looking for a tool to save you time with your academic essay citations and bibliography? Cite This For ME’s IEEE referencing generator lets you do just that. 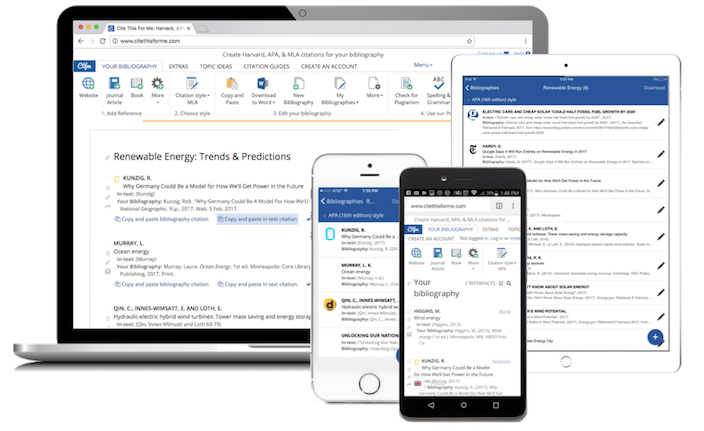 You can format references quickly, simply and smartly in the IEEE style recognised by your academic institution using our free web and mobile app. IEEE referencing is a widely used system for attributing credit to authors whose findings, facts or theories have contributed to a new research paper. The IEEE reference format is the standard referencing format set by The Institute of Electrical and Electronics Engineers and is based on the widely used Chicago referencing style. Where many styles have the author’s name shown within the text, IEEE uses a numbering system to make sure the paper is still easily readable. The number within the text correlates to a numbered reference at the end of the research paper to make it clear which source contributed to which section of the paper. Each IEEE reference has a corresponding IEEE citation within the text. The in-text citation is shown as a number within square brackets and allows the reader to find the full reference in the numbered bibliography at the end of the text. The full IEEE reference should include all the necessary information for the reader to be able to find the exact source of the information, theory or finding that contributed to the paper or essay. When referencing in IEEE style, there are different formats for each source type – for example a book should be formatted differently to a website or academic journal in the reference list. A lot to think about? You can use Cite This For ME’s IEEE reference generator to create your references with a click. Simply search for the book, journal or website you want to reference, set it to IEEE style and have the whole thing generated automatically for you. The sky is blue . S. Cottrell, The study skills handbook. Basingstoke: Palgrave Macmillan, 2013.